Avoiding defenders, Derek Krogmann (12) looks for an open teammate. Krogmann scored 512 points on the season and broke the school’s all-time point and rebound records with a career total of 1,679 points and 1128 rebounds. 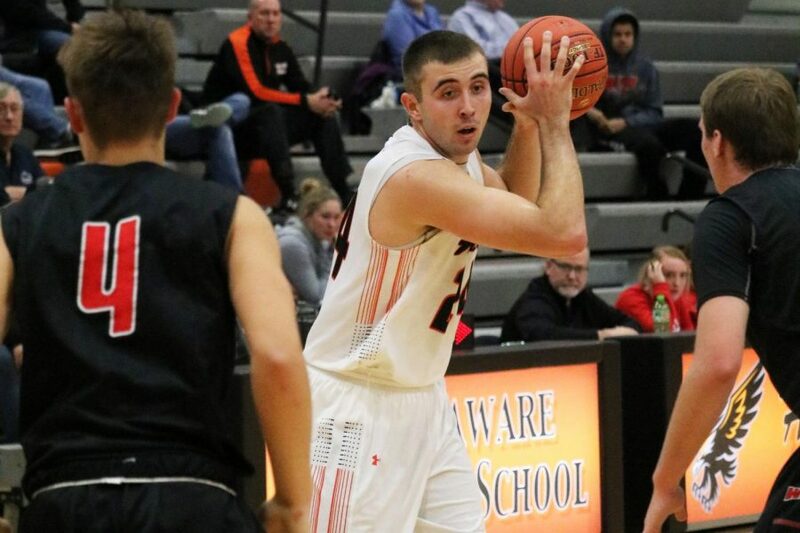 Senior Derek Krogmann shines not only on the basketball court but also in the classroom. Derek Krogmann (12) holds a certificate recognizing his Academic All-State honor. 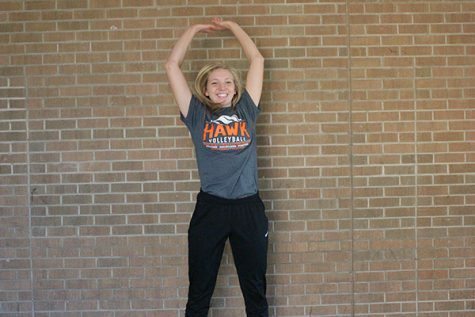 The Academic All-State team averaged 12.3 points per game; Krogmann averaged 21.3 points per game. 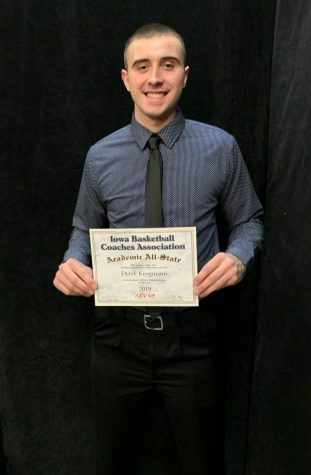 On March 7, the potential valedictorian and University of Northern Iowa commit received the Iowa Basketball Coaches Association Academic (IBCA) All-State award. A panel of IBCA members selected 21 recipients, including Krogmann, out of a pool of 85 athletes. According to the Iowa Basketball Coaches Association, the Academic All-State team averages a 30.3 composite ACT score, a 4.0 GPA, and a 12.3 points per game scoring average. 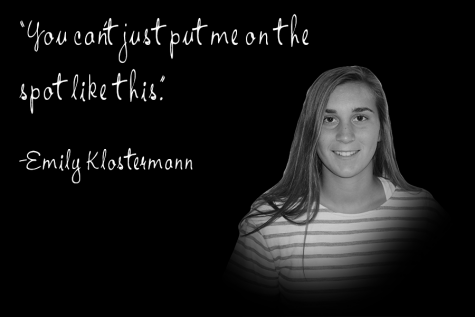 On top of this academic accomplishment, Krogmann was also selected for Class 3A’s first-team All-State and earned WaMaC Conference honors, making the WaMaC East All-Conference first team and earning the WaMaC East Player of the Year title. Head Basketball Coach Matt Uthoff is impressed not only with Krogmann’s work ethic on and off the court but also his character.